Fun Classic Games to play at birthday parties. These fun games are great for birthday parties. 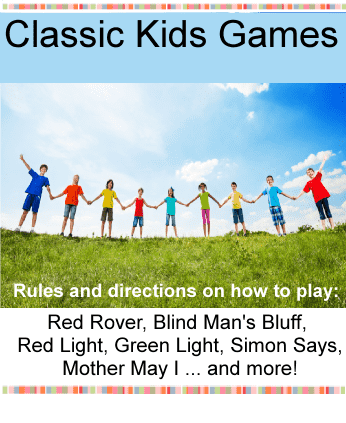 Instructions and directions for Red Rover, Simon Says, Red Light / Green Light and Blind Mans Bluff. For more party games see our birthday party games page. Divide children into two teams and have them line up about 30 feet apart or more. Have each team tightly hold hands. Each team calls out “Red Rover, Red Rover send ________ (children choose a name of a child from the opposite team) right over”. The child that is called runs to the other team and tries to break through their joined hands. If the child breaks through then they take an opponent back to their side. If they can’t break through they must join the other team. Have children stand up in front of “Simon” (Usually an adult or older child). The children must do what Simon tells them to do … but only if they say “Simon says” first. Example: Simon says … pat your tummy. Simon says … jump up and down. Simon says … summersault. The children can’t stop until Simon says … Simon says stop patting your tummy. If you give a command without saying Simon Says and the children do it then that child is out. Keep going until there is one child left. Fun and easy and Kids love it! Tip: Think of about 25 commands before you start. Lay out two lengths of rope 25 feet apart to make the start and finish lines. The birthday child (who is now called the Police Officer) stands in front of the finish line while the others stand behind the start line. The Police Officer turns his/her back on the other players and shouts, "Green Light!" and then turns around and counts to five. While the Police Officer is counts to 5 the players try to run or walk toward the finish line. When they finish counting they shout "Red Light!" and turn around quickly. The other players must freeze instantly. If the Police Officer catches anyone moving, that player must return to the starting line. Continue until one of the players crosses the line while the Police Officer's back is turned. That player then becomes the Police Officer. Blindfold one of the players - the blindfolded player is called the "Blind Man". Spin them around three times and while you are spinning them the other players quickly find a place to stand in the room. After the third spin the players are not allowed to move from their position, but they can move their body's to avoid being touched by the Blind man. The blind man moves around the room until they touch someone. Then the blind man, by feeling the face of the person they touched, has to guess who the person is. If the blind man guesses correctly, the tagged player becomes the blind man. You will need a button or another small object such as a penny. The object of the game is to find out who in the circle has the button. Have the kids stand or sit in a circle with their hands in front - palms together. The child who has the button first takes it and goes around the circle of children. They will stop at each player and put their hands inside the hands of the children in the circle. In one of the players hands they will drop the button ... but they will continue going around the circle so that no one knows which player now has the button. The child who dropped the button then points to a player and says "Button, button, who has the button?" and then the player replies "________ has the button!". If the player is right then they become the new button holder. If they are wrong then the next player in the circle gets to guess. Players pass the button behind their backs. The button stops randomly. The player who started the button tries to guess where it stopped. If they guess right then they take that child's spot in the circle. After the button has been passed behind the backs they can ask questions to find out who has the button. Set a limit on the number of questions they can ask - 4 or 5 is a good number. Not meant for children under 3 because of the choking hazard. Players follow the commands of the "Mother" - the winner is the first one to reach the “mother”. Choose who will be the "mother" first. That player then stands on one end of a large playing field or room. The other players line up side by side at the opposite end of the playing field. The Mother one at a time calls a player and tells them to take a certain number of steps towards them. The Mother also decides what kind of steps they will take. For example they could have the player take 3 giant steps, 4 twirling steps, 2 marching steps, 5 baby steps ... and so on. Before the players take their steps that they have been assigned they must ask "Mother May I?". And then the mother answers "Yes, you may." If they player forgets to ask "Mother May I?" then they have to go back to the starting line and begin again. Players try not to be tagged by Mr. Wolf. Choose who will be the Wolf. Mr. Wolf then lines up at the opposite end of the playing area from the rest of the players. The Wolf then turns around and has his back to the rest of the players. The players ask all together "What time is it Mr. Wolf?" Then the Wolf will answer with a time - "It's 7:00 o'clock". Then the players have to take that many steps towards the Wolf. 7:00 would be 7 steps. At anytime during the game the Wolf can answer "Supper Time!!" and with that they can turn around and try to tag as many kids as possible before they run back to their base where they started. Whoever is tagged by the Wolf becomes a wolf and will line up on the Wolf side of the playing field. All the wolves can tag players after the main wolf calls "supper time!". The last person left untagged becomes the new Mr. Wolf and the game starts again.